Turtle Friendly Lighting: What Is Turtle Safe Lighting? Trying to understand Sea Turtle Lighting can often times feel like trying to decipher unwritten code. It seems to many as if Code Enforcement or people associated with the Sea Turtles want a property or home owner to change everything and make the property dark. Sometimes it even comes across as no matter what you do, you can’t seem to do it right because what they want always changes. Here at SeaTurtleLighting.net, our job is to make understanding Turtle Safe Lighting a whole lot easier! 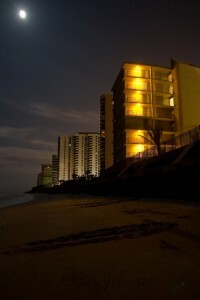 Turtle Friendly Lighting is the technique of shielding light emitted from a property from the beach-side, also known as Beach-side Shielding. In no way is this technique designed to force a property to go black at night or risk the life safety of residents or guests. This could be better described as a practice of using the best methods for energy efficiency which truly benefits a property and its electrical usage. By using solid State Lighting, such as LED, and ensuring that light is directed down to the ground and walkways you make the most efficient use of the product and lumens per watt of light where you need them. This eliminates light trespass, or light that is directed into the sky, towards the beach and into open unoccupied areas, which is all wasteful light or wasteful lumens per watt. In Turtle Friendly Lighting, a property will use Approved Lighting Fixtures and Approved Amber LED light bulbs that have been tested and carefully selected by the FWC because of their wavelengths, energy efficiency and effective control of light trespass. Turtle Safe Lighting is on the other hand a technique for ensuring the safety of Sea Turtles by form of blacking out a property or turning lights out to ensure complete darkness along a property. This is the most undesired by property owners along coastal areas, and is only enforced by local codes that are more stringent than those of the State and FWC. In most cases, this technique is not demanded of property owners and condos unless you live in select areas on the east coast of Florida. The main component of Turtle Safe Lighting is the absence of lighting on balconies and patios on multi-floor facilities and complete shielding on ground floors or single story buildings to include curtains, window film, and fixture shielding. Blacking out a property at night should only be done in cases where people are not required to transit an area for the requirement of building egress. In other words, if you have a 4’x8′ foot balcony on the back of a hotel room this can be blacked out with the absence of light because its only for people to step out of a room to enjoy a view. (Blacking out a hotel room balcony actually provides better visibility at night for scenic views). If, on the other hand, the beach-side of the hotel has a long walkway with exterior doors to rooms along the walkway or pool and patio areas, this is used for emergency egress and can not be blacked out. Therefore this would default back to the effective use of light in the Turtle Friendly Lighting category. Many groups or agencies refer to themselves or their requests as “Turtle Safe”. Although they are referring to the safety of turtles or the survival of the turtles, what they are actually requesting is that you use “Turtle Friendly” methods of energy efficiency and beach-side shielding. This will result in a beautiful property with better night views of the beach and lower electric bills. Unless you live in an area where the local municipality calls for the “Blackening out” of balconies, use the principles of Turtle Friendly Lighting. You may view a complete list of “Energy Efficient Turtle Approved Lamps and Fixtures” here at Seaturtlelighting.net! Copyright 2011 SeaTurtleLighting.net a Division of Synergy Lighting, Inc., Inc. All Rights Reserved.